This is the sequel to a book I reviewed a month or so ago, If I Stay. 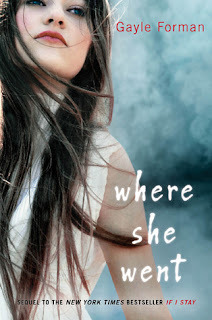 Where she went follows the main characters of If I Stay, Mia and Adam, as they cope with the aftermath of Mia's family's accident. Three years have passed and Mia and Adam are no longer together. Adam has become a famous rock star and Mia a cello prodigy. They have a chance encounter in New York that will change both of their futures. I love the story. I really enjoyed If I Stay, but I liked Where She Went more. I loved having Adam as a narrator and getting to see his thoughts and feelings. And I also liked going back and forth in time and seeing what was happening in the present day as well as what had happened over the past three years. I read it in one sitting and immediately passed it on to Bestie. I recommend it if you like YA and you're looking for a good story that deals with heavier plot points than boyfriends and mean girls at school. It's good contemporary YA that doesn't fall into the "issue" category or the "lighthearted reading" category. And finally, I want to ask you, Reader Friends, a question. I've been thinking about it quite a bit since I read If I Stay and it would fit better with that review, but you'll have to take it here. Let's you are in a car accident that kills your entire family. Your parents and any siblings. You are severly injured and will have a difficult recovery. Given those circumstances, would you choose to continue living or would you choose to die and be with your family? For those of you who are adults, would your answer change now that you are grown, married, living on your own, working full time, raising kids, etc? I've thought several times since reading If I Stay about what I would do. Honestly, I think that given the choice to live or die when I was in high school, knowing that my parents, Buddy, Sugar Bear, and David were all dead, I probably would have chosen to die. I can't imagine choosing to continue living at that point in my life without my family, even though I know that is not the typical "Christian" answer. But at the point I'm at now, I know I would choose to live. I have Luke, and the little boys, and the cat child to think about. And I have a life of my own now. In high school so much of "me" was really about my family. Now I have a career, a home, and a life outside of my parents and siblings. And I'm certainly not saying that I don't love my parents or my siblings. But I think I would feel differently now about life without them. What about you? I wouldn't necessarily say that Forman is an exceptional author either. Plot wise, I really enjoyed If I Stay. This one is certainly on my TBR list. What I read in June!